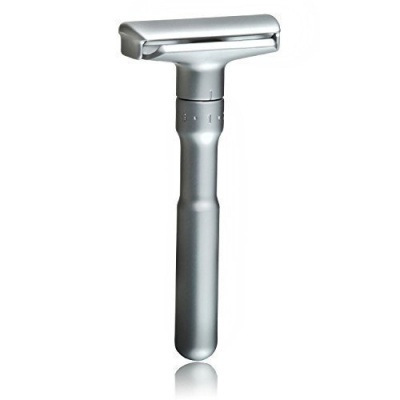 An adjustable heavyweight safety razor. An adjustable heavyweight safety razor. 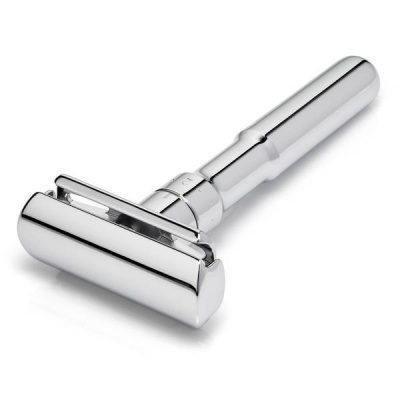 This razor allows you to dial in the perfect shave. A twist to the handle changes the gap between the blade and the bar giving you a more or less aggressive shave as your need demands. Great for a zero waste shave and reducing plastic consumption. This high quality, heavyweight razor is 10cm in length. All standard double edge replacement blades can be used with this razor. Made in Germany by quality assured Merkur of Solingen. Made of recyclable chrome-plated steel. Please Note: Due to age restriction laws, no blades are included with this razor.